Extend care management across provider, health plan and communities to deliver quality and value. A highly configurable, scalable, and functional cloud-based platform to drive impactful population care management programs, engage patients in their health and enable value-based care. Virtual connectivity across the entire healthcare ecosystem – providers, health plans, patients, care managers, caregivers, communities. A unified, curated view of traditionally siloed data that extends beyond the EMR, providing the right information at the right time. 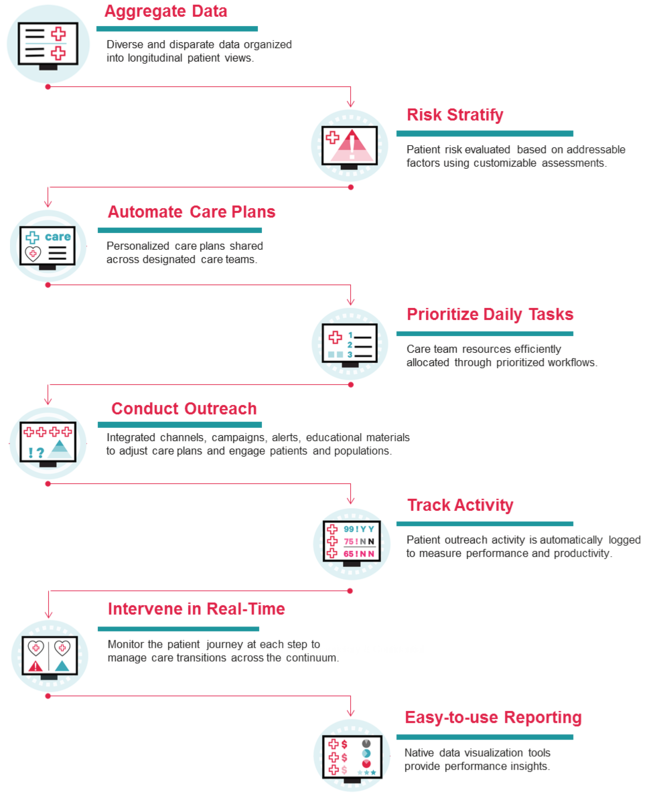 Automated patient risk stratification using medical, behavioral and social factors for whole-person care and prioritized workflows. Tools for care teams to work in partnership with multiple providers and patients to optimize care delivery. Integrated data visualization turns data into actionable insights. Embedded multi-modal channels to drive timely and efficient communication across the ecosystem. Agile implementation, payor and system agnostic. Augments the EMR, accelerating workflow integration. A healthier population and reduction in Total Cost of Care. Informed health plans, providers, care teams and patients. Improved care transitions, timely interventions and enhanced continuity of care. Quality incentive revenue in value-based contracts. Improved compliance to performance and quality measures. Increased patient adherence to care plans and better health outcomes.